As far as songs go, I’m a big fan of The Wheels on the Bus, because it’s a song that works for many ages and many themes. It is a particularly good song to sing with a toddler group, because the accompanying actions are easy, fun and just plain big. But a classic song, one you sing many, many (maybe more than many) times, needs a reboot every once in awhile. Thankfully, there’s the Animals on the Bus version, and here’s my version of that version. I printed out clip art of a bus and several animals, and laminated the pieces (we weren’t allowed to laminate items at my former POW, so I bought my own laminator off ebay, but it was so expensive to buy the laminating sheets that I rarely used it–however this is one that benefits from the protection). I taped the bus to a small brown lunch bag. Line up the animals on the flannel board, and talk about the noises or motions that the animals make. I like to throw in the motion ones, too, to keep it interesting–the bat goes flap, the bunny goes hop, the lobster goes snap, etc. If you have a small enough group, it’s fun to to let the kids take turns choosing an animal and placing it in the bag on the bus. Then sing “The lion on the bus goes roar, roar, roar/etc/all through the town”. Now, there’s a choose your own adventure-type ending for this one. If you like a loud ending, ask the kids to choose their favorite animal on the bus. Sing the last verse and have them all make the noise of the favorite animal at the same time. If you like a dramatic ending, have a skunk get on the bus last of all (the skunk on the bus goes pew), causing the other animals to make a quick exit–turn the bag upside down so the animals spill out. 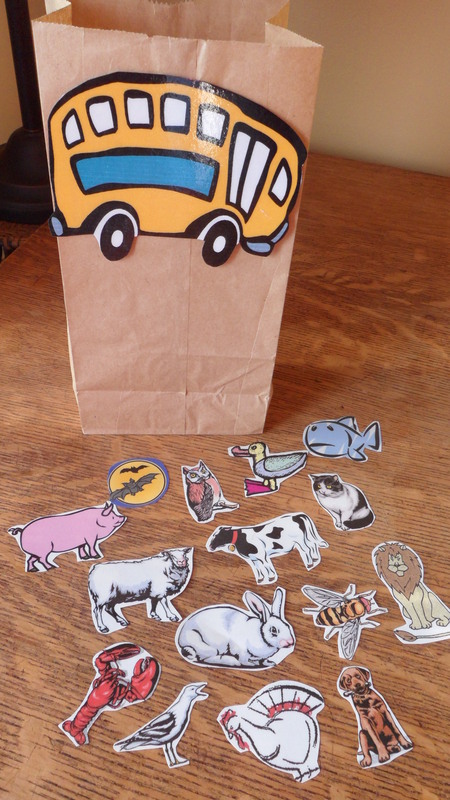 Or the bus can have too many animals on it, and get heavier and heavier (the bag gets heavier and heavier), causing again all the animals to spill out. You can, of course, reverse the whole process, and place the animals in the bag in the beginning, and have the kids take turns choosing an animal from the bag, placing the animal on the flannelboard, and then singing the appropriate verse. That’s one heck of a bus ride!